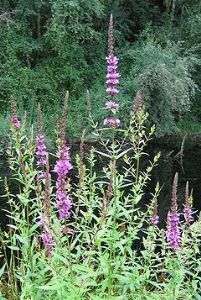 Lythrum salicaria Purple loosestrife is a tall, multi-stemmed (30-50 per plant), perennial that can grow to 1m in height in damp conditions at the margins of ponds. Flowering in July to October, when pink to purplish flowers develop in 4-16 in. (10.2-40.6 cm) long spikes at the tops of the stems. It is native to Britain and the rest of Europe where it is not very common, but it appears to have become a serious invader of wetlands in America, probably because it doesn't have a natural feeder on it there.Purple loosestrife provides a model of successful biological control. Research began in 1985 and today the plant is managed well in America and New Zealand with a number of insects that feed on it. Five species of beetle use purple loosestrife as their natural food source and they can do significant damage to the plant. It is a great nectar plant for butterflies and other insects and has been used as a nectar plant for bee-keeping.